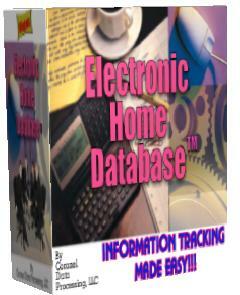 The Electronic Home Database - Information Tracking Made Easy!!! 1. People wanting to track personal information. 2. People looking to track home maintenance. 3. People looking to track collectables. Information that is easily available and easy to get to is what makes computers so awesome! 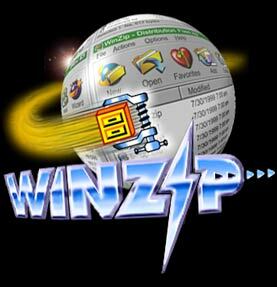 As computer consultants who have designed professional databases for over twenty-five years, we fully understand that knowledge that is easily available is power! While a lot of databases have been designed with business in mind, not much emphasis has been placed solely with the home user in mind, until now. Those databases designed for home use usually only target one area of interest. We understand that home users have a need and desire to also track information. 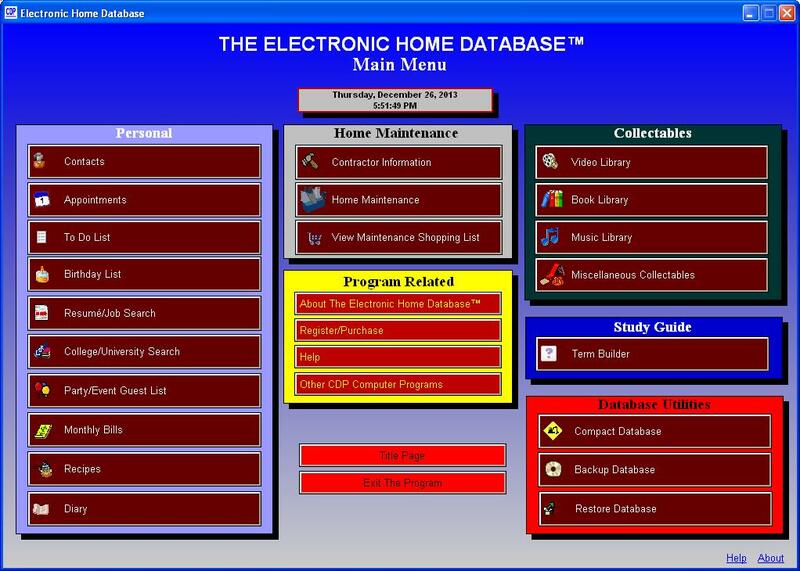 Thus, we have developed an information tracking program, especially created with the home user in mind, called The Electronic Home DatabaseJ. This program allows you, the home user, to track a variety of useful items. You can track contacts, appointments, things to do, birthdays, resumés, parties/events, monthly bills, recipes, collectables, diary entries, and home maintenance. You can also increase your knowledge in any subject with our easy-to-use Terms Builder module. 1. 150 mouth watering recipes that you can enjoy anytime. 2. Over 200 job sites in the Résumé/Job Search module that can help you look for work or change career paths during these tough economic times. 3. Over 150 Colleges and Universities to help in planning for higher learning. Use this College/University Search module to track schools that meet your goals and ambitions, crucial college entrance tests, and extracurricular activities. There is an option to track scholarships and financial aid applied for. There are also 100 scholarships that you can now apply to! By ordering on-line today, we will deliver the program to you via a download link which means you can be up and running with the Electronic Home Database™ within 24 hours. 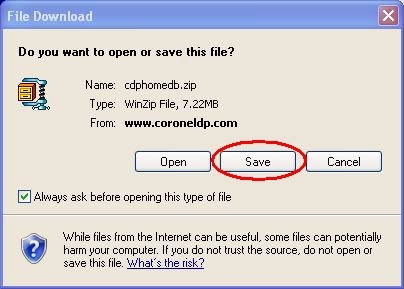 Go with the default settings and the program will be installed into a folder called C:\CDP\HOMEDATA. To run the program, click START-PROGRAMS-CDP-HOMEDATA or switch to the C:\CDP\HOMEDATA folder, and run the HOMEDATA.EXE program.